Mi-T-Mist is a topical antimicrobial designed to cleanse the mouthpiece and provide a refreshing agent that will remove residue build-up from the instrument. Easy to use: spray the fine mist on the mouthpiece then let evaporate (about 45 seconds). To freshen and clean the inside of the instrument, spray liberally into the instrument and immediately swab. 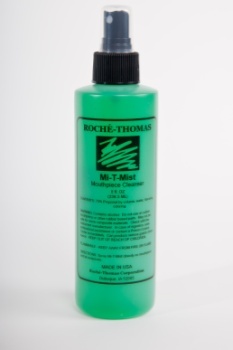 Mi-T-Mist evaporates quickly and assists in eliminating moisture and bacteria. This product comes in a 8oz cylinder container with a fine mist sprayer. Don't be fooled by the copycats trying to duplicate our look and feel with their, what we like to call 'Green Stufff', it doesn't compare. We are the originators of the mouthpiece cleanser. Our high standards for quality is why we are the industries leaders. Here at Roche-Thomas we are proud to say that ALL aspects of our products are manufactured in the USA so you know you are purchasing the finest products on the market.